What Does Tax Reform Mean for Low- and Moderate-Income Workers? To download audio from this event, click here. Tax policy can dramatically shape the availability of economic opportunities for low- and moderate-income workers. Taxes generate revenue for public goods and services, such as healthcare, infrastructure, and education, which significantly affect low- and moderate-income workers’ ability to connect to and thrive in today’s economy. Certain tax credits – such as the EITC and the Child Tax Credit – are targeted to low- and moderate-income working families to supplement incomes and encourage work. Additionally, taxes influence the behaviors of corporations, including their decisions of where to locate, how many and what kind of jobs to create, and what benefits and compensation to offer workers. 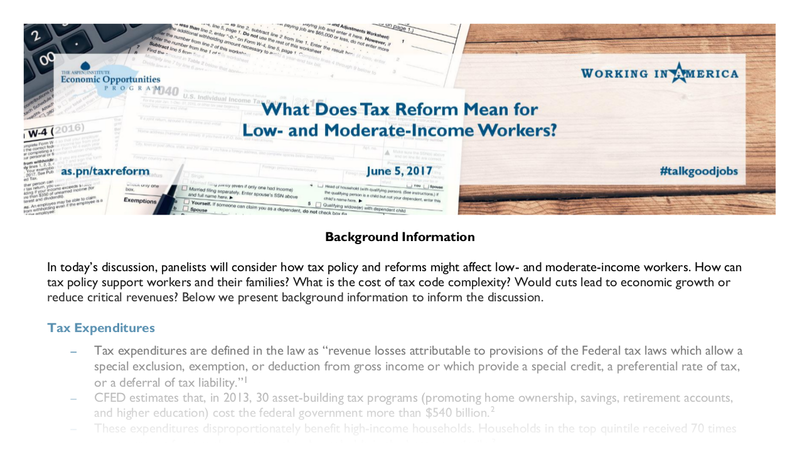 As Congress and the White House consider reforms to US tax policy, we invite you to explore how the most-discussed reforms would affect low- and moderate-income workers if implemented. 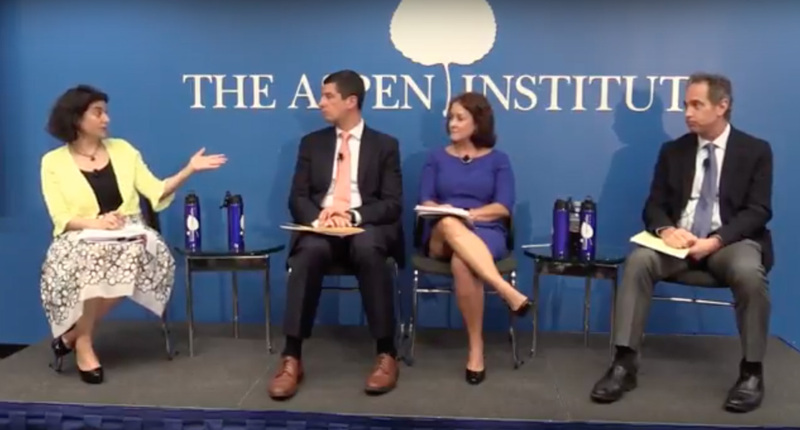 In this lunchtime conversation held at the Aspen Institute, a diverse panel of experts considered the many ways that tax policy shapes economic opportunities, reflect on the ideas and proposals put forth to date, and highlight areas where tax reform could benefit working people, corporations, and the United States economy more broadly. 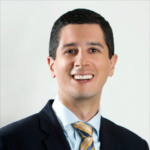 At the American Enterprise Institute (AEI), Alex Brill studies the fiscal, economic, and political consequences of tax, budget, health care, retirement security, and trade policies. 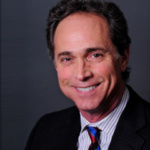 Alex is the author of a pro-growth proposal to reduce the corporate tax rate to 25 percent, and “The Real Tax Burden: More than Dollars and Cents” (2011), coauthored with Alan D. Viard. Before joining AEI, Alex served as the policy director and chief economist of the House Ways and Means Committee, on the staff of the White House Council of Economic Advisers, and on the staff of the President’s Fiscal Commission (Simpson-Bowles) and the Republican Platform Committee (2008). Frank helped found Americans for Tax Fairness, a diverse campaign of 425 endorsing organizations united in support of a progressive federal tax system. Previously, Frank managed the Strengthen Social Security Campaign, a coalition of 320 organizations. He also managed a health care campaign in support of the Affordable Care Act for the Communications Workers of America. He was issue campaigns director at the Change to Win Labor Federation and director of Public Citizen’s Congress Watch. Frank also was senior policy advisor to the US House Committee on Government Operations and issues director for Jesse Jackson’s 1988 presidential campaign. He is the editor of Keep Hope Alive: Jesse Jackson’s 1988 Presidential Campaign. As the Sarasota Area President of Florida’s United Way Suncoast, Mireya Eavey creates long-term community economic development strategies designed to reduce poverty and help children and families succeed. Mireya has written about the importance of tax-assistance programs and tax credits, highlighting the work of United Way Suncoast’s Volunteer Income Tax Assistance program. 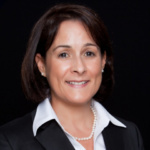 In addition to her role with United Way Suncoast, Mireya is the executive director of CareerEdge Funders Collaborative, an organization that connects funders, educators, employers, and community-based organizations to educate, train, employ, and promote employees. In 2016, she was named Philanthropic Newsmaker of the Year by SRQ Magazine. Jeanne Sahadi is a senior writer at CNNMoney. Among her primary beats, she covers federal taxes, spending and debt. She also reports on career issues – including pay and benefits, company culture and the future of work. With CNN since 1998, Sahadi has reported on a wide range of policy debates, including health reform, bankruptcy reform and entitlement reform. She also has covered personal finance for CNNMoney and was a columnist for Money magazine. 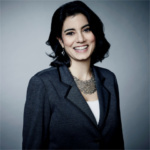 A graduate of Haverford College, Sahadi has been a guest on many CNN shows as well as the shows of CNN radio affiliates and outside stations, including NPR. Background Information: What Does Tax Reform Mean for Low- and Moderate-Income Workers? Join the conversation on Twitter with the hashtag #talkgoodjobs.